Just a note to all our customers that we are open now on Saturday's until the final Saturday in September 2016 the 24th. 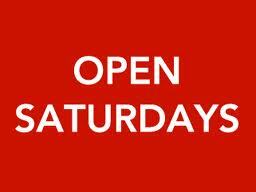 Opening times on Saturday are as normal 09.00hrs to 12.00hrs. From the 24th September 2016 until the Saturday 4th March 2017 we will be open weekdays 08.00hrs to 17.00hrs. Many thanks and we look forward to seeing you in due course.